In two weeks Ashley and Jaime will celebrate this grand wedding at the Ringling Museum. One of my favorite features is something I came up with for this 1920's, peacock feathered extravaganza -- a cake that features the architectural details of the Ca d'Zan. I can only imagine what the real deal will look like... I for one can't wait! 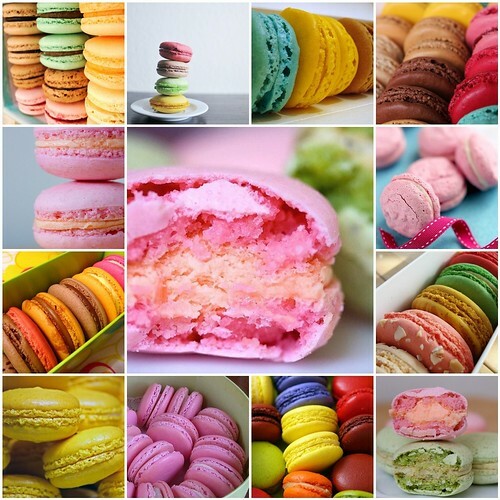 Here we are, post Valentine's Day... and I though I would mention one of my favorite favors -- for a wedding or just to tell someone you love them this is a super sweet way to do so -- the Macaron! Crispy and fluffy Meringue on the outside and creamy almond paste on the inside. They come in almost any color and flavor you desire. Some have traced its French debut back to the arrival of Catherine de Medici's Italian pastry chefs whom she brought with her in 1533 upon marrying Henry II of France. If you happen to be in Paris you MUST stop at Laduree, one of the most famous patisseries which offeres endless Macaron flavors. In Sarasota, Florida we have our local version at Le Macaron on St Armand's Circle and they do justice to the little ol' Macaron. Delic!!! Once again, a little fabric goes a long way. Stephanie was on a budget for her wedding reception. She got married at the Sarasota Yacht Club, Florida. With stunning water views one doesn't need much to top that... However, the club is open to its members at all times. 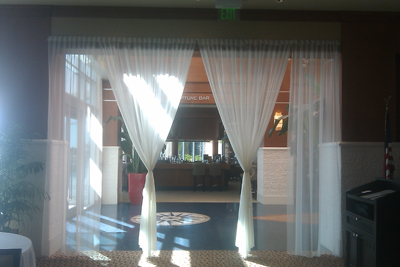 In order to create a subtle separation between the bar and dining room where the wedding guests were, our very own talented Daniel draped the entryway with a sheer fabric that added a festive and private feel -- enough to give people the idea "this is where the wedding is taking place." Those who know me, know that I'm a sucker for almost anything vintage. 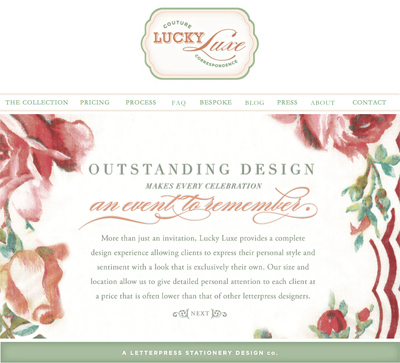 I recently was introduced to a fabulous invitation company called Lucky-Luxe based in Mississippi. Erin, the owner creates wonderfully authentic looking "vintage-ized" images of almost anything and turns them into lovely old fashioned looking postcards. 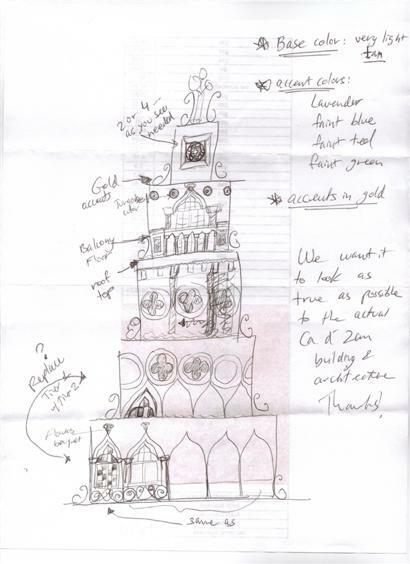 We are currently working on Ashely and Jaime's Dave the Date cards from the Ca d'Zan mansion. I can't wait to see the final result!!! 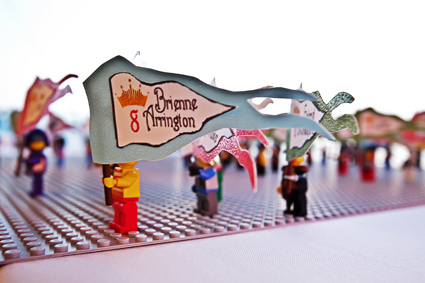 One of the editors at "The Knot" emailed me yesterday that they shared the wedding planning idea of the Lego Place Cards with their blog readers. Here it is again, from Tirsa and Brian's wedding at the Ringling Museum. It's retro, it's inexpensive and it's unique (just make sure they kids don't get their hands on it!). Wedding Planning Tip of the Week: Leather! I met Talia, the owner of Green Apple Accessories through the Ring Corsage photoshoot. Talia crafts beautiful leather accessories such as hair pieces, shoe clips and more that I absolutely adore! The different styles would be a great customized touch to any wedding, especially if your favorite flower is out of season... My tip of the week is by Talia of Green Apple Accessories: "The advantage of finding a simple timeless dress is that the bride can have fun with accessories. Try adding colored shoes to your dress for a bit of pop as you walk down the isle, or take notice of the ribbon used for the flower pieces. Maybe try polka dots or stripes for a little variety in texture. This is an area many times passed over that can add to the overall look of the day."